Cut it out, just cut it out!! "Unfortunately, now Brandon Jennings is probably going to get stuck with No. 55 with his inevitable return." What is this obsession over Brandon Jennings, a broken player who plays zero defense and was a shot happy ball hog, even at his best, when we're obtaining the respectability we once had? We need a reliable backup PG, not a favorite of the media. He gave us 15 great games in 3 years but, 15 games in 3 years?! Milwaukee is his basketball home, not Detroit. Why don't they want him back in Milwaukee for any reason? We're on the rise and taking a backward step isn't the way to continue rising. J. Lin played exceptionally well in the playoffs. His basketball IQ is fantastic. Lin was at his best guarding Wade in the Miami series. D. Williams has been discussed on the web lately but he seems to be past his prime and loves living in Dallas. If SVG goes for a 2nd tier player then I would go with Augustine. The summer league roster is set. There are some big men to watch. Johnson at point forward??? Basketball is back for 5 more games. How exciting! Does this team have a leader? That is the question that needs answering! Without a leader, someone that holds everyone accountable and has the trust of his mates such that when he's demanding more from them, they fall in line, is a big missing piece. The Bad boys had Zeke, with Laimbeer being his enforcer. The 2004 team had Chauncey Billups... right now, we have nobody! IMO, Reggie made strides last year towards being that guy, but he was a soft leader, maybe this year he'll be more forceful. Either way, we need a clear leader, like in the past to focus this team, IMO. Oracle wrote: We made the playoffs as the weakest playoff team in the group, 8th Seed! That means we're on the fence and could fall either way. Back into the lottery, or move up. I believe we will either maintain the 8th position or move up, but we'll be back in the playoffs. Having said that, nothing is guaranteed, and we'll have to fight for it and come out of the gate swinging. The Wizards were an odd case. It's really strange to go from the ECF to the lottery with the same personnel... really strange. We also have a better coach & GM, so there's that! cool breeze wrote: What I mean by this is our Pistons need to build confidence in THE TEAM. They need to come in with an attitude this season that can carry over to the next when their chances of making the playoffs and going deeper are better. Some of us are not confident that this group of players may not be able to make the playoffs next season. There are too many ifs relating to how Drummond and Jackson will play. Both have huge weaknesses playing defense. Both are capable of being players their team can count on when it counts to play solid defense. But will they???? Hopefully Harris, Morris, KCP and Johnson will come back and show off their hard work. Harris in my opinion is the best player on the team because he comes to play hard every night and he is a skilled player on both ends of the floor. Morris is a gritty guy who also is ready to play every night. Johnson is still a young kid but he is a smart kid and a hard worker so we can expect him to be really hungry. And then there is Bullock who I hope remains on this team next season. This guy is in his contract season and to me he has extremely high potential to become a deadly consistent shooter. And he can defend too. Being that the Pistons are not likely to be good enough to make it to the conference finals next year, perhaps management should be conservative relating to offering a lot of money to suspect players in free agency. As much as I do not believe in Brandon Jennings, the rumor is that he might take a one year contract. If Detroit cannot get a really good point guard, then I would try to get a guy on a one year deal and wait until next summer to land an A type guy. As for power forward, maybe this team can survive playing the same guys they played last season. Maybe give Tolliver a one year deal too if we can't secure a good power forward on a one year deal. I am sure that SVG and his staff have it all figured out so I will sit back and be happy. Just my opinion but I think if we don't upgrade at least one starting position we could be in big trouble. We might get by with just upgrading the bench in large part but I don't think we can take this same roster into the playoff next season without up grading some portions of our roster. We depend too much on the growth prospects we need to add serious veteran leadership be it from the bench or starting. Wouldn't it be great to know what the core players are talking about in private? How far do they really believe they can take the Pistons next season? We are adding two rookies to the mix who might contribute some. It would be crazy to over pay for some older player that is not in high demand with his current team. The fit is really important too. The core guys who got the team into the playoffs are young guns. Their team chemistry is the best we fans have seen in years. I can't imagine that Anthony or the new comer from Chicago will be on the team next fall. Will SVG go in another direction and beat the bushes in an attempt to find maybe two complimentary players among the summer league players? Players who might sign big free agent contracts might be ready to coast for 3 years in semi retirement. I do not want SVG to give away any of our core studs just yet. Maybe the sit back and wait approach will be SVG's best move and see who is available among the point guards. He gave up Spencer Dinwiddie so the pressure is on to sign somebody with proven ability. Who is it. SVG has a short list. Which one will take a two year deal with a team option for the 2nd year? Augustine likes playing for SVG and he performs well under his coaching. I just wish he could play a higher grade of defense but Augustine does have guts and always plays hard. I would take him over Jennings. And I think Jennings wants to be a Laker. He sure has talked a lot about playing for LA in the past. I hope that SVG tries Stanley Johnson at point forward some in the summer league games. There are some power forwards and point guards that have been overlooked and they are tired of being on the outside looking in. Great leaders know which direction to go based on the circumstances they are given. Whatever management does now it will be about tweaking things or making small changes. They must be creative and use magic if necessary. Meanwhile, the players returning need to be talking to each other and demanding that each player comes back determined to be more consistent offensively and 30% better on the defensive end. Does this team have a leader? which player will step up and rule? It would help if we had John Wall. Unless Reggie Jackson returns next fall and makes his stamp on the defensive end, Wall will laugh at him like he did when Reggie signed that big contract. Being that we have no real stars, all the players must create something special to overcome the impact of true basketball bullies that rule the NBA. What an opportunity for these Piston players! I feel their excitement of what is possible if you have worked hard to improve. We made the playoffs as the weakest playoff team in the group, 8th Seed! What I mean by this is our Pistons need to build confidence in THE TEAM. They need to come in with an attitude this season that can carry over to the next when their chances of making the playoffs and going deeper are better. Some of us are not confident that this group of players may not be able to make the playoffs next season. There are too many ifs relating to how Drummond and Jackson will play. Both have huge weaknesses playing defense. Both are capable of being players their team can count on when it counts to play solid defense. But will they???? Hopefully Harris, Morris, KCP and Johnson will come back and show off their hard work. Harris in my opinion is the best player on the team because he comes to play hard every night and he is a skilled player on both ends of the floor. Morris is a gritty guy who also is ready to play every night. Johnson is still a young kid but he is a smart kid and a hard worker so we can expect him to be really hungry. And then there is Bullock who I hope remains on this team next season. This guy is in his contract season and to me he has extremely high potential to become a deadly consistent shooter. And he can defend too. I like going after Seth (the other Curry). He is young, can shoot, versatile off the bounce or catch. could give us options off the bench, playing with Stanimal and Silent G. Otherwise, DJ, or maybe hmmm, I hear Houston is shopping Patrick Beverly, a beast (w/o a shot, but a defensive beast nonetheless), or maybe Ish Smith/Sessions type of guy. Get in Dre's Head, according to the Detroit News: "The talk just after the season about Drummond trying something drastically different on free throws — including possibly shooting underhanded — has died down. Van Gundy said they’re looking more at improving his mental approach and technique before he gets to the line." Exactly, he needs a sports-shrink/hypnotist type. This strategy may also spill over to help other aspects of his game. BTW: Keep KCP, stepped up big in the playoffs. That counts and those are the kind of barometers we need to be looking at going forward, IMO. Sooooo much Stuff... where to begin? Great conversation surrounding Ellenson, I really like this kid so far, but what impresses me even more is the comparison of SVG vs Joe Dumars! Joe did some great stuff early on, but he was more of a seat of the pants, go with instinct type of GM. SVG is too, but SVG & Staff does more homework... a LOT more homework! Both ways can work, but when instincts fail you, you really need the research to bail you out. SVG is always prepared, and Stanley Johnson & Ellenson, along with silent G(props to ballin) is evidence of a well researched and thought out plan to just WIN baby!!! Ellenson is a real steal! At only 19 years old, with great size and body build, ball handling skills, there no telling where this kid could end up. I'm not saying he's the next anybody, just saying he has the talent and tools to be very good if he puts in the work. Time will tell. This takes some of the sting of not getting Frank the Tank as well as Stanley last year, because this kid could have the bigger upside. Wise: Damn Wise, you keep making me say WTF . I had to think twice when you said you almost wished we had Moose back. It's an interesting thought! There are a LOT of ways we would be a better team with Moose, especially if we had a defensive PF to pair with him. Having a Center that could finish games in the 4th, and was a surer scorer, could really put us into the conversation. Having said that, I expect Drummond to "Get It" soon, but you did raise an interesting thought! Sparma: Interesting comparison with Cardinal, but I agree, Ellenson is way more skilled and has a higher upside. Given the comparison Murph made between Henry Ellenson and Brian Cardinal, I was curious to track the most direct statistical comparison we have now: their collegiate careers. Cardinal was redshirted his freshman year at Purdue. I suspect his Big Ten competition was tougher than Ellenson’s at Marquette. Also, I'm guessing there’s more scoring in college now than in Cardinal’s day. I liked Cardinal as a gritty and surprisingly skilled sub, but guessed the 3.5 inch difference in favor of Ellenson would make for a rebounding discrepancy. Based on limited video evidence I watched along with some reading, Ellenson looks like a highly skilled Freshman, with unusual passing and ball handling skills for a big man and a promising shooting stroke. As a Freshman, Ellenson averaged 17 points and 11.7 rebounds, significantly better than Cardinal averaged as a fifth year Senior. After being redshirted, Cardinal averaged 10.6 points and 6.1 rebounds (figuring the average from the total Wikipedia supplies) as a second year Freshman. As a Sophomore he averaged 12 points and 4.9 rebounds. As a Junior, he averaged 11.4 points and 5.2 rebounds. As a Senior he averaged 13.9 points and 6 rebounds. That’s not good qualitative scouting on my part, but just some number reviewing and a bit of crunching by someone who does little watching these days. The statistical superiority, significant height advantage, apparent skill discrepancy, as well as the major advantage of youth to Henry all suggest Ellenson is a far more promising prospect than Cardinal was based on their college careers. Their respective draft statuses seem to bear such a difference in promise at the time of becoming pro out. All that doesn’t mean that there not a significant comparison or that Cardinal might have advanced more as a pro than Ellenson will. Also, Cardinal may well have been a tougher defender than Ellenson ever will be. Ellenson may be fortunate to have an NBA career of the length of Cardinal's. But I think we can safely conclude that Ellenson is superior as an NBA prospect coming out of college to what Cardinal was coming out of Purdue. May prove to be a good choice. He looks like a desirable block of clay from which a crediable NBA player can be molded. The kid has a lot of Dirk in his game. Maybe it will be a case of the Bucks passing on Dirk, twice. Sebastian wrote: For stealing OUR Pick: Thon Maker. For stealing OUR Pick: Thon Maker. Kalib's nickname is Zeus. He is a strong 7 foot plus 4 year starter playing center for Arizona. Nobody pushed him around in 4 years of college basketball. By the way, Arizona plays no zone defense. He had an injury early last season and perhaps that is why he was not invited to the Chicago combine. I wrote a post on him earlier in the week mentioning that Zeus should not be overlooked by NBA GMs. He is a guy coaches love. Zeus does the dirty work always defending the paint and setting great screens. He runs the court as well as any big man in the NBA so if a team is looking for a big guy who boxes out, always makes the right decision in the defensive rotation, directs his teammates on defense, rebounds the basketball and sets great picks, then give him a chance. Zeus shines in the classroom as an honor student. He will also be playing for Washington after the Orlando games are over. This Piston management team is really impressive. No stone is left unturned. Maybe SVG has some guards in mind to add who have been overlooked in this draft that we can get a look at in the summer league games. As the details keep coming on Ellenson, I get happier. This guy might be just what this team needs especially when we think about how good he might become in 3 years. My worry now is all about Andre Drummond and the max contract he will be signing this summer. He has been playing now for a considerable amount of time but still lacks a key thing when it comes to playing defense - COURT AWARENESS. His mind is not working fast enough yet. Are the coaches working with him on that weakness this summer??? Does Andre realize his weaknesses? If Drummond can correct his reaction time to defensive situations and become a real shot blocker, he will be a true monster and his team will be really difficult to beat. Keep your fingers crossed that this will be the season where Andre puts it all together. cool breeze wrote: Bayless, Clarkston, Lin and Curry might help this Piston team. Bayless is overlooked a lot but I thought he played well against the Pistons last season. Clarkston and Lin would be great but difficult to obtain. And Curry might be impossible to bring to Detroit. And we can probably get him for very little in return SVG needs to be on the phone with Utah. And I'm starting to worry so I'm starting to like the idea of Al Horford even if we slightly over pay him. It would be stupid not to make an attempt to get Burke WTF soon unless the Pistons have a lock on signing a top tier type point guard. Burke might get 30% better playing for the Pistons. He is a high IQ player. I mentioned 4 players on my wish list but all of them might not want to play for Detroit. Please Stan do not spend your money on Brandon Jennings. This management team seems to cover all the details so perhaps we should sit back and see what happens. We have to remember that Joe Dumars is no longer running things. Bayless, Clarkston, Lin and Curry might help this Piston team. Bayless is overlooked a lot but I thought he played well against the Pistons last season. Clarkston and Lin would be great but difficult to obtain. And Curry might be impossible to bring to Detroit. Sebastian wrote: Okay a quick re-cap: GM Stan and his boy, Bower did about as well as they could for OUR Pistons during last night's Draft. Let's be real folks, the kid, Henry Ellenson will only serve as a replacement for OUR 12th-man, Joel Anthony. The 49th pick, Michael Gbinije could be very resourceful, if GM Stan is able to create a valid roster spot by finding some team that will take F@ckin' Jodie Meeks off of OUR hands. I suspect that Memphis, Milwaukee, or Philly could find room on their rosters for the final year of Meeks' contract. Truth be told, GM Stan and his boy, Bower are going to have to be successful at acquiring the right players during July to add to the roster. OUR roster needs are clear: WE need a starting PG and a guy, who can provide flexible minutes as a back-up PF and C.
Currently, the Pistons are scheduled to pay out $72,625,000 with the salary cap for 2016 set at $92,000,000 and the tax applied at $111,000,000. So, there is roughtly $20,000,000 to work with before Dre's max offer of $25 million even comes into play. GM Stan should offer Rajon Rondo $13 million for 3 years and $7 million for four years to Donatas Motiejunas. Or, offer B. Jennings $11 for 4 years and Motiejunas $9 for 4 years. If WE are able to acquire B. Jennings, then Reggie can continue to start but I would like to see both, Reggie and Jennings on the floor together much more than they played together during the brief time that they both were available to play during this past season. WE should start Rondo and make Reggie OUR 6th-man. Reggie as OUR sixth man would make for a dynamic three guard rotation, sprinkled in with a little Stanley at the 2 and 3 and D-Mo as a back-up PF and C will make OUR Pistons equally competitive to the Pacers, Knicks, Raptors, and make OUR Pistons a serious threat to the (I hate saying this, but ...) 2016 NBA Champion Cavaliers. Let's face it Pistons Pals: GM Stan and his boy, Bower are going to have to be on top of their games when the clock strikes July 1. BallinD wrote: Can Silent G be our new third string PG, definitely appears to be an upgrade over Stache. Now let's get Seth Curry for our second guy. Avg 16/5 in April once he got PT. Shot 49% from three. Has a player option out of Sactown. Or maybe Augustin, but Curry is 6-2 and has genes. I Like Ellensen, he can do a lot of things. Is he a poor man's Dirk? Time will tell. Biggest action coming up. We have a lot of wings, all of them promising. Trade/FA splash? Dare we wish for Horford? He would change everything, if we could get him. Put us in the conversation for ECF matchup with LeBully. Thanks for clarifying the total amount Detroit has to play with to acquire the players we need. On the other hand, I see that you brought up the name of Brandon Jennings again. What is going on? Jennings could not cut it last season wearing the Piston uniform. And it appears that he didn't impress Scott S. in Orlando. At one point in time I thought that Jennings planned to retire because he knows his time as passed. I would take Augustine over Jennings any day of the week but Augustine is only a hair better defender than Jennings. In my opinion, this next pick for a new point guard is the most critical move Stan Van Gundy will make this season. We need a guy who can step in and play like a starting point guard if necessary. Jackson is the type of player who goes all out and drives into the paint a lot. Therefore, he is more likely to have significant injury. If we add a second rate point guard with clear defects, the Pistons will be in big trouble unless the team can survive with a point forward. Rondo might be a great addition if his personality doesn't poison the team chemistry and I believe he is now older and wiser so he should stay on a more even keel. And as others have mentioned, there could be the Curry option or Charlotte's back up point guard who might be available. I am not excited about Cleveland's back up guy Mr. D. This spot will test SVG to the limit. Keep your fingers crossed for luck. I can't believe that the new draftees will be wearing numbers 8 amd 9, respectively. I would have thought the number 8 would be Stanley's new number, the same number that he wore during his single season at U of A and I thought that the 9 would look decent on Reggie. Does anyone know what new numbers Stanley and Reggie will be wearing, as you'll remember Big Ben's numbers 3 (not my boy Rodney Stuckey) and 1 (Chauncy's number, not AI's) would be retired? "Vegas" has come out with odds of reaching the NBA Finals next year, GS at 2:1, Cleveland at 3:-1. We're tied with several teams at 125:1, with just two teams with worse odds, Phoenix being one. Philly and the Knicks are given the same odds as us at the Finals. Weird. Maybe they know the Knicks will pull in a haul in free agency? I also think Cleveland's got a significant better chance than GS to make it back to the Finals, coming out of the East. I'm starting to like OKC's chances, with a heck of a trade (it should work out well for Orlando for a year too). 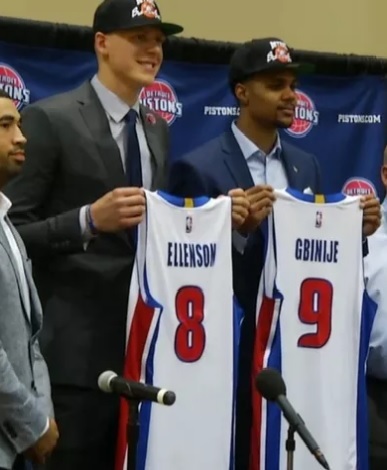 Okay a quick re-cap: GM Stan and his boy, Bower did about as well as they could for OUR Pistons during last night's Draft. Like your idea of snagging Curry. Much better choice than Jennings or Augustin in my opinion. And I am all in for Mr. Grand Ledge but he most likely will go to a team that can offer the most cash. Ellenson is looking better and better. My buddies in the know keep calling and telling me great stuff about this guy. He wants to be a complete basketball player. He has big goals to succeed and he is an amazing worker. Also, I was told that when he was shorter played some point guard. Maybe that is where he acquired his driving skills. In Bill Walton's book "Back From the Dead" he mentions that he was a slasher guard as a kid playing in San Diego the hot bed of basketball in his day. Two guys in their 30s were playing a pick up game and he was torching them. So the two thugs took out his knees with one hitting him low and the other high at the same moment. Walton had knee surgery and was told to stay in bed for at least 3 months to recover. When he got up, he had grown over 6 inches and kept growing. But getting his start playing as a kid in the backcourt against his big brother and former Dallas Cowboy football player. Walton says that he one of the reasons why he was able to out fox his competition when playing in the paint as a college and pro player. Gbinije is another guy who might really help the Pistons. I like the fact that he was a key player on a team that made it to the Final 4. that says a lot about what kind of talent he has and his toughness. Great job Stan and the rest of the crew! Can Silent G be our new third string PG, definitely appears to be an upgrade over Stache. Now let's get Seth Curry for our second guy. Avg 16/5 in April once he got PT. Shot 49% from three. Has a player option out of Sactown. Or maybe Augustin, but Curry is 6-2 and has genes. WTF wrote: I agree and I don't Oracle sure Andre was a hard project to pass on and he has surpassed that label of just being a project. The expectation grew with the proclamation by many including SVG that he was Franchise Player Tag worthy and they needed to build around him. All criticism of Andre game is actually fair game now and he needs to step up. It's not like we're moaning about him developing a post game and Dream like foot work, just make your freaking FT's and be more of a force and impact defensively. These are issues about Andre game that may never get better over any amount of time. Still I haven't suggested we trade Andre simply put someone better before him or behind on the bench. - It's fair IMO, to criticize his game, he needs that, and it's fair to expect more. So if you aren't talking about giving up and moving him, then I good with that. IMO, it's also fair to question if he's a max player, but of course, he's getting it based on who they think he'll be, not on who he is! As for KCP FIT FIT FIT and FIT again is going to be a major issue with me when it comes to this guy. He'll never be a shooter he will always be a scorer. I don't knock KCP for his progression or his growth as a player I question his FIT and I could likely do the same thing with Harris and Morris as well but its more glaring and obvious at that SG position that this kid isn't the right fit. - On KCP, you were the first to observe the fit issue, and you are right, the fit is not perfect, but if he comes back shooting the 3 a lot better, he's a great fit. We have the time to wait and see, and you're right, there are issues with Morris/Harris, but they don't need to be solved right now. A sign and trade is better option next season but that doesn't really say KCP isn't a valuable trade piece now. Many player get traded in the last year of a contract even a rookie one. We just seen this happen over the past 2 days. - I'm not saying that, I'm saying that to obtain maximum value we need to wait, and for more than value reasons. Also, too many things have to work to do it early. Trading KCP isn't blowing up the core nor will it be a chemistry stopper either. You have to take risk to get better and no one looking to win the Title tomorrow but the team needs to keep pace with Boston, Indy, Orlando and stay ahead of the Buck, Wizards, and Knicks, they need to improve on that 8th seed. - I didn't say blow up or stopper, there's a huge canyon between that and absolutely no impact. The larger point is that we shouldn't be thinking this way until we get a sniff of where SVG is going! Once the trades and FA activity has settled down, we will have a full view of what we're going into the season with. IMO, we're going to lose 2-3 players that are currently on the roster. SVG will not stand still with all of this improvement going on around him, he knows that the other teams have thrown the first punch, he needs to respond.